I love gingerbread (The Monday Box has recipes for gingerbread as a bar, a 3-2-1 microwave cake, and as a molded cookie), but I have to admit, I am picky. Gingerbread is a spice cake, cookie, or bar. 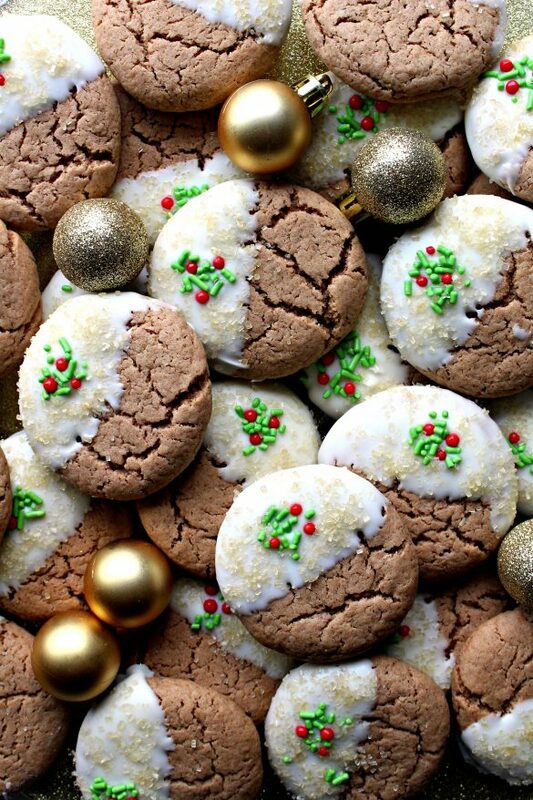 The spices used to make gingerbread usually include ginger, nutmeg, cinnamon, and cloves. Cloves are a problem for me. If I can taste the cloves, I don’t eat the gingerbread. I hate cloves. They remind me of the numbing solution dentists used when I was a child. Of course, when you bake, you can put in or leave out whatever spices you want. 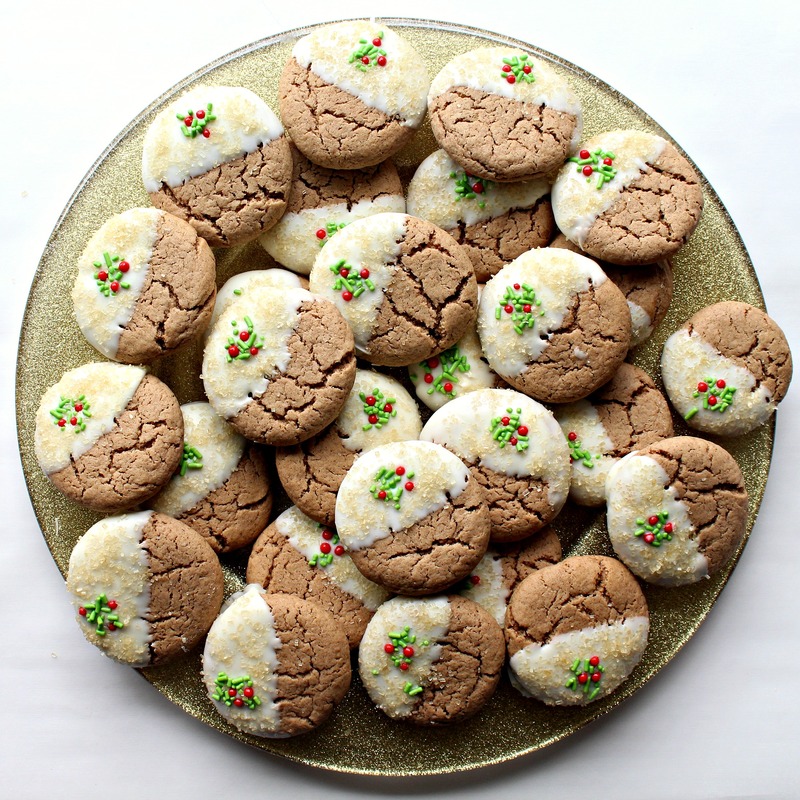 Gingerbread Spice Cookies are recipe #3 in The Monday Box week of Time Saver Recipes. All of the recipes in this series use a “secret shortcut ingredient” (cake mix or refrigerated cookie dough) for easy, speedy preparation. The recipe for Gingerbread Spice Cookies uses spice cake mix, but if you are picky about your spices like I am ( or if you simply don’t have spice cake mix on hand), you can use yellow (vanilla) cake mix and customize the spices. To make your Gingerbread Spice Cookies using your own signature blend of spices, combine a yellow cake mix with ¼ – ½ teaspoon of nutmeg, ginger, cloves, and cardamom for a total of 1 ¼ teaspoons plus one teaspoon of cinnamon. Technically, the addition of cardamom makes it a chai spice blend, but I think cardamom is delicious in gingerbread. Though most of the recipes in the Time Saver Recipes series were inspired by a shortcut cookbook, I made numerous changes when adapting the recipes to make them care package friendly. 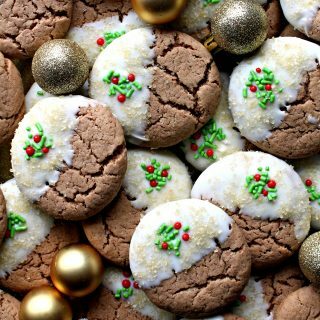 To make Gingerbread Spice Cookies a great make-ahead holiday cookie, as well as a good choice for long distance care packages, I used vegetable oil as the fat. Cookies made with oil tend to stay chewy for an extra long time. 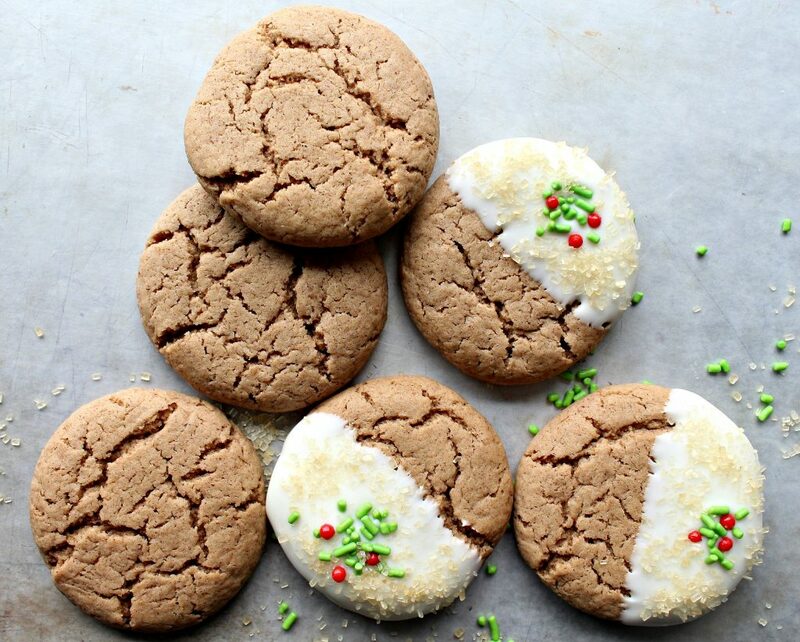 If you like chewy cookies, you will love Gingerbread Spice Cookies! With Christmas sprinkles added, Gingerbread Spice Cookies make a festive gift and an eye catching addition to holiday cookie platters. Be sure to keep a few for yourself. I found it difficult to stop nibbling on these white chocolate dipped treats! For those that believe gingerbread should be reserved for December only, I suggest that these cookies can also be called Spice Cookies or Chai Cookies. That way, they can be savored all year long! Be sure to see the other Time Saver Recipes in this series. Chocolate Covered Cherry Bars and Cinnamon Chip Biscotti are not to be missed! Check back tomorrow for the next Time Saver Recipe! In the bowl of an electric mixer, combine cake mix, oil, eggs, pie spice, and cardamom. Use a small scoop (2 teaspoons) to scoop out dough onto prepared baking sheet 2” apart. Bake for 8-12 minutes until barely set at center. Cool for 1 minute on baking sheet before transferring onto wire rack to cool completely. 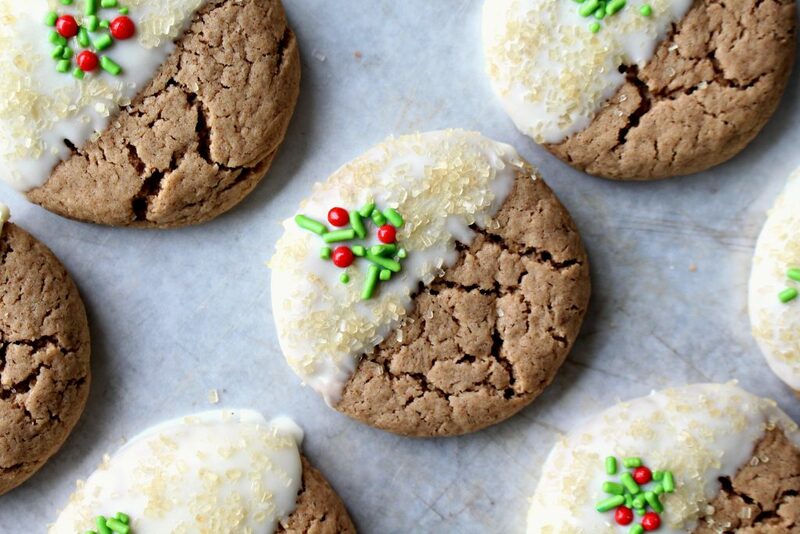 To decorate: Dip ½ of cookie in melted white chocolate. Place on a wax paper lined baking sheet. Onto melted chocolate, sprinkle a few green jimmies and 3 red ball sprinkles to look like holly, then sprinkle with raw sugar. Place baking sheet in refrigerator to set chocolate for about 10 minutes. Store cookies in an airtight container at room temperature, with wax paper between layers, for 7 days or more. Wrap pairs of cookies, bottoms together, in plastic wrap. Stack cookie bundles in an airtight container or freezer weight zip lock bag. When you make cookies, they are so best I love gingerbread cookies, I too bake during christmas time. I am going to pin, tweet this one. These look so pretty. I love the idea of using oil to keep them chewy. I also hate cloves and after reading your post I realized why I have such a negative reaction to the scent of it. I had completely forgotten about the numbing clove scented liquid at the dentist. As soon as I read it, the horrible childhood dental experience came flooding back. Your decorations on these lovely cookies is perfection. SO creative and beautiful. 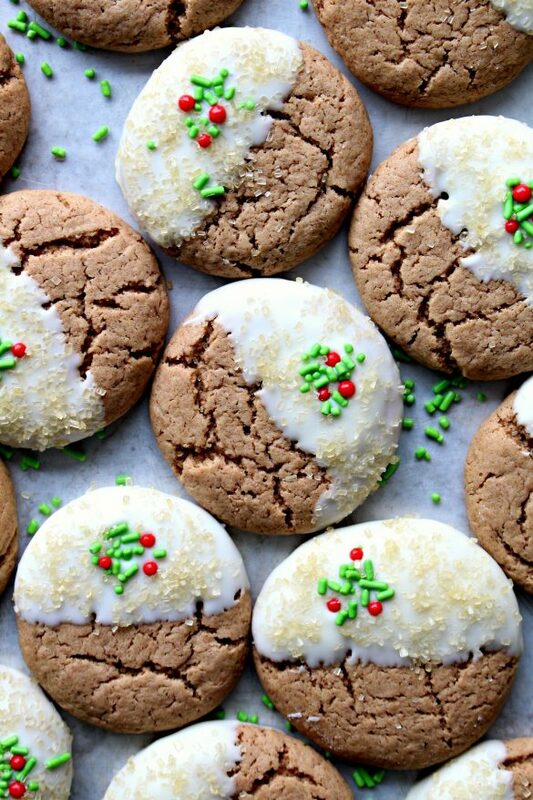 I’m going to add these to my gingerbread roundup! Wendy, these cookies are so beautiful. Magazine beautiful. I love gingerbread too, and I’m not a big fan of cloves either. And I love EASY. I’m looking for a cookie to give to my boys’ teachers. I think this might be the one. It looks like you are baking up a storm Wendy! So many gorgeous cookies – I want them all! I love gingerbread but don’t like them heavy on the cloves either – or the molasses – I usually use half of what the recipe calls for and add honey for the rest. They are absolutely perfect dipped in white chocolate! The flavors are so good together. Thanks, Reeni! I HAVE been baking up a storm!! 7 recipes in 7 days? What was I thinking?! 😉 I have a delicious suggestion for the next time you are cutting molasses (I so agree). Try Lyle’s Golden Syrup for the other half instead of honey. I think you will love it! These are so pretty and I love the icing design on them! Thank you, Caroline! This decorating was amazingly quick: a dip in melted white chocolate followed by a pinch (literally) of sprinkles. Happy holidays! These are so cute. I love gingerbread and the topping just adds to the cookies. Thank you for sharing on Inspire or be Inspired Link up. These are such adorable cookies! 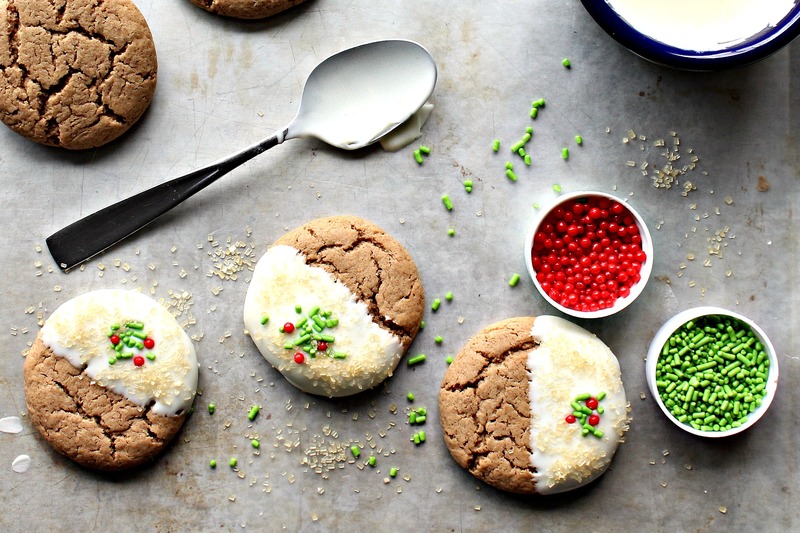 I’ll definitely try out the vegetable oil trick to keep cookies moist! I prefer using oil in cakes to keep them moist, but never thought to use it in cookies. Merry Christmas and Happy Fiesta Friday!! Thank you, Ai! I will be experimenting more with oil in cookies because, so far, the results have been great! As long as butter isn’t the main flavor (like shortbread), I am getting better results with oil. Wishing you happy holidays and a peace filled New Year! Your Gingerbread Spice Cookies look delicious, I love Gingerbread. Thanks so much for sharing your awesome recipe with us at Full Plate Thursday! Hope you are having a wonderful week and hope to see you soon! Thanks, Miz Helen! I love Gingerbread too! 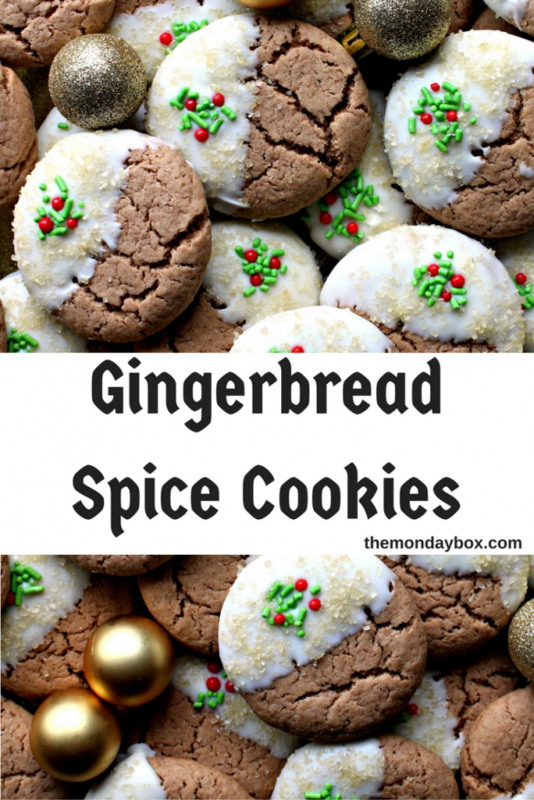 These are great for last minute cookies or when time is short or just when you need gingerbread fast. 😉 Thanks for hosting, Full Plate Thursday!